Coachella is not just about the music and arts. It’s about the fashion too! Historically, it’s the women’s fashion that has made the headlines over the years at this world-renowned music and arts festival. But this year, men have also been showing off their personalities through their style. Now in it’s 19th year, the Coachella Festival has always been an event where you can express yourself through your clothing and accessories. Held at the Empire Polo Club in Indio, California, the event began on April 13th 2018 and will run till April 22nd. And the fashions tend to reflect the laid-back nature of a Californian lifestyle. Coachella is all about comfort, style and looking cool in the heat of the desert. And this year it’s about channelling the trends of the 90s. This means the return of faded denim, graphic tees and sneakers. And one accessory that is a must-have in California is eyewear – so don’t forget the sunglasses! We might not all be able to make headlines like Beyonce but we can take our style to the next level by stealing some of the trends from Coachella 2018 and pairing them with height increasing shoes. The luxury Coconut Grove elevator sneaker has a sense of style and elegance that will pair well with just about every trend at Coachella and through the summer. The clean white patent leather helps the black crocodile leather detailing stand out. And with the added benefit of a hidden 2.6 inch heel you’ll feel confident and walk taller. The Coconut Grove sneaker will look sleek with either sports shorts, denim cutoffs or jeans. Pair with a white t-shirt and shades for a classic look. Canvas or suede sneakers and high-tops are also a good choice for festivals and can be worn with shorts or jeans. The Italian handcrafted Sahara high-tops are height increasing shoes that will keep you on trend all summer long. The desert sand suede sneakers can increase your height by up to 4 inches, giving you the confidence boost you need to pull off any style at Coachella. For an elegant look, and if you don’t want to wear sneakers, follow in the footsteps of stylish Canadian fashion blogger, Kish Raveendran. 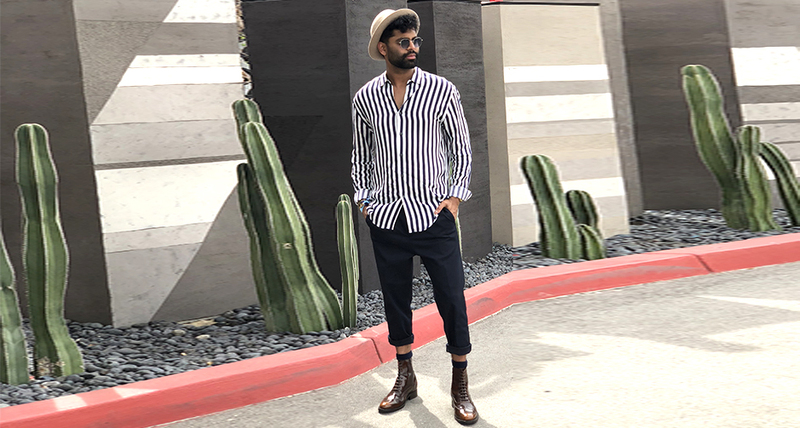 He chose to style his handmade GuidoMaggi Idaho elevator boots, which increase height up to 4 inches, with rolled up black denims, a black and white striped shirt, cream hat and aviator sunglasses and looked slick, comfortable and festival-ready.